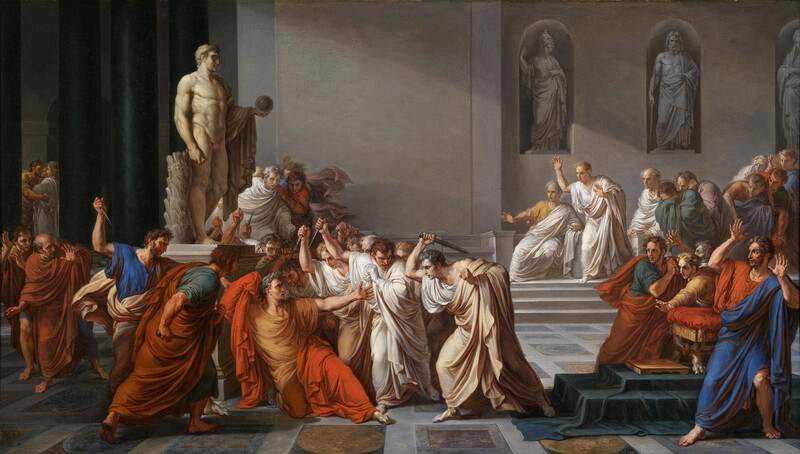 On March 15, 44 BC — the Ides of March — Julius Caesar, Dictator of the Roman Republic, was stabbed to death by several Roman senators. 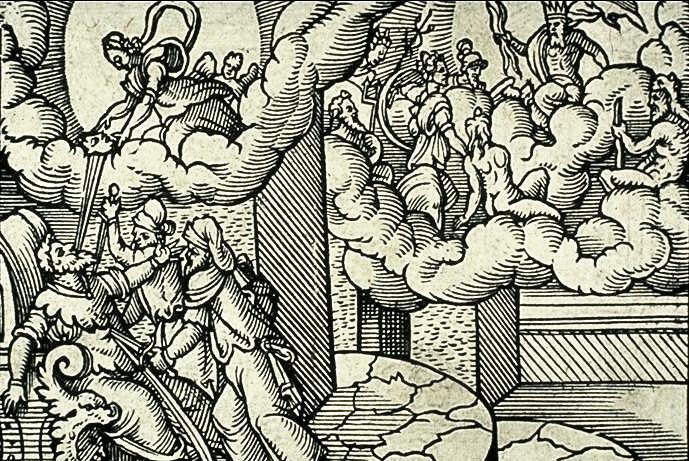 The assassination of Caesar was the result of a conspiracy by many senators led by Gaius Cassius Longinus, Decimus Junius Brutus Albinus, and Marcus Junius Brutus. They stabbed Caesar (23 times) to death in a location adjacent to the Theatre of Pompey. Caesar had recently been declared dictator perpetuo by the Senate of the Roman Republic. This declaration made many senators fear that Caesar wanted to overthrow the Senate in favor of totalitarianism, as well as the fear that Caesar’s pro plebeian manifesto would endanger them financially. 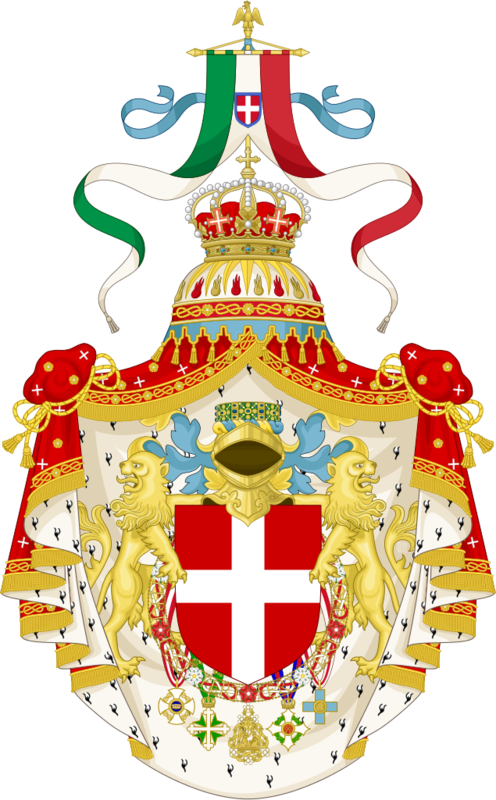 The conspirators were unable to restore the Roman Republic, and the ramifications of the assassination led to the Liberators’ civil war and ultimately to the Principate period of the Roman Empire. The Senate named Caesar dictator perpetuo (“dictator in perpetuity”). Roman mints produced a denarius coin with this title and his likeness on one side, and with an image of the goddess Ceres and Caesar’s title of Augur Pontifex Maximus on the reverse. According to Cassius Dio, writing over 200 years later, a senatorial delegation went to inform Caesar of new honors they had bestowed upon him in 44 BC. Caesar received them while sitting in the Temple of Venus Genetrix, rather than rising to meet them. 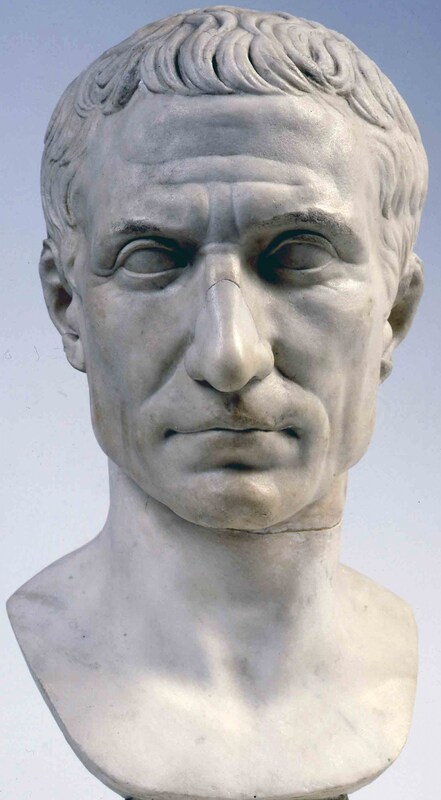 Bust of Julius Caesar, posthumous portrait in marble, 44-30 BC, Preserved in the Vatican Museums (Museo Pio Clementino, Gallery of busts, inv. 713). Suetonius wrote (almost 150 years later) that Caesar failed to rise in the temple, either because he was restrained by Cornelius Balbus or that he balked at the suggestion he should rise. Suetonius also gave the account of a crowd assembled to greet Caesar upon his return to Rome. A member of the crowd placed a laurel wreath on the statue of Caesar on the Rostra. The tribunes Gaius Epidius Marullus and Lucius Caesetius Flavus ordered that the wreath be removed as it was a symbol of Jupiter and royalty. Caesar had the tribunes removed from office through his official powers. According to Suetonius, Caesar was unable to dissociate himself from the royal title from this point forward. Suetonius also gives the story that a crowd shouted to him rex (“king”), to which Caesar replied, “I am Caesar, not Rex” (“Ego caesar, non rex.“). Also, at the festival of the Lupercalia, while he gave a speech from the Rostra, Mark Antony, who had been elected co-consul with Caesar, attempted to place a crown on his head several times. Caesar put it aside to use as a sacrifice to Jupiter Optimus Maximus. Plutarch and Suetonius are similar in their depiction of these events, but Dio combines the stories, writing that the tribunes arrested the citizens who placed diadems or wreaths on statues of Caesar. He then places the crowd shouting “rex” on the Alban Hill with the tribunes arresting a member of this crowd as well. The plebeian protested that he was unable to speak his mind freely. Caesar then brought the tribunes before the senate and put the matter to a vote, thereafter removing them from office and erasing their names from the records. 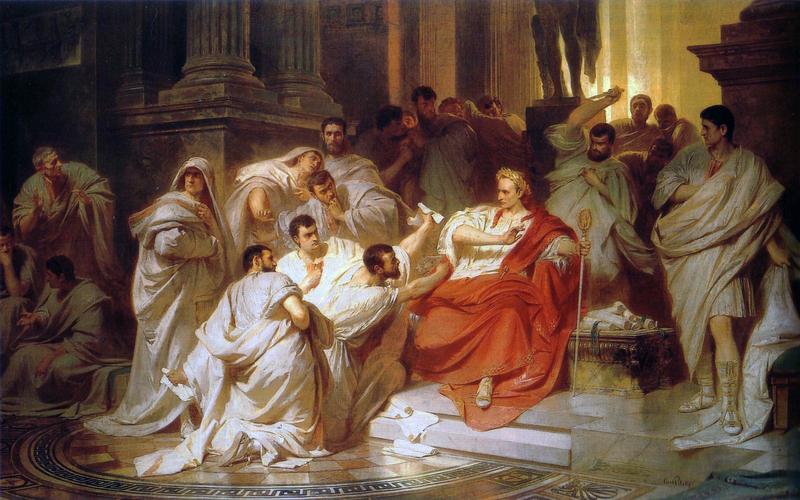 The Murder of Caesar, oil on canvas by Karl von Piloty, 1865. Currently in the collections of the Lower Saxony State Museum (Niedersächsisches Landesmuseum) in Hannover, Germany. Suetonius adds that Lucius Cotta proposed to the Senate that Caesar should be granted the title of “king”, for it was prophesied that only a king would conquer Parthia. Caesar intended to invade Parthia, a task that later gave considerable trouble to Mark Antony during the second triumvirate. His many titles and honors from the Senate were ultimately merely honorary. Caesar continually strove for more power to govern, with as little dependence as possible on honorary titles or the Senate. The placating and ennobling of Caesar did not allay ultimate confrontation, as the Senate was still the authority granting Caesar his titles. Formal power resided in them, resulting in tension with Caesar. The conspirators never met exactly openly, but they assembled a few at a time in each other’s homes. There were many discussions and proposals, as might be expected, while they investigated how and where to execute their design. Some suggested that they should make the attempt along the Sacred Way, which was one of his favorite walks. Another idea was to do it at the elections, during which he had to cross a bridge to appoint the magistrates in the Campus Martius. Someone proposed that they draw lots for some to push him from the bridge and others to run up and kill him. A third plan was to wait for a coming gladiatorial show. The advantage of that was, because of the show, no suspicion would be aroused if arms were seen. The majority opinion, however, favored killing him while he sat in the Senate. He would be there by himself, since only Senators were admitted, and the conspirators could hide their daggers beneath their togas. This plan won the day. The Assassination of Julius Caesar oil on canvas by Vincenzo Camuccini between 1804 and 1805. Currently in the collections of Galleria Nazionale d’Arte Moderna e Contemporanea in Rome, Italy. …his friends were alarmed at certain rumors and tried to stop him going to the senate-house, as did his doctors, for he was suffering from one of his occasional dizzy spells. His wife, Calpurnia, especially, who was frightened by some visions in her dreams, clung to him and said that she would not let him go out that day. But [Decimus] Brutus, one of the conspirators who was then thought of as a firm friend, came up and said, ‘What is this, Caesar? Are you a man to pay attention to a woman’s dreams and the idle gossip of stupid men, and to insult the Senate by not going out, although it has honored you and has been specially summoned by you? But listen to me, cast aside the forebodings of all these people, and come. The Senate has been in session waiting for you since early this morning.’ This swayed Caesar and he left. Caesar had been preparing to invade the Parthian Empire (a campaign later taken up by his successor, Mark Antony) and planned to leave for the East in the latter half of March. This forced a timetable onto the conspirators. Two days before the actual assassination, Cassius met with the conspirators and told them that, should anyone discover the plan, they were to turn their knives on themselves. His successors did attempt the conquests of Parthia and Germania, but without lasting results. The Romans did not number days of a month from the first to the last day. Instead, they counted back from three fixed points of the month: the Nones (5th or 7th, depending on the length of the month), the Ides (13th or 15th), and the Kalends (1st of the following month). The Ides occurred near the midpoint, on the 13th for most months, but on the 15th for March, May, July, and October. The Ides were supposed to be determined by the full moon, reflecting the lunar origin of the Roman calendar. On the earliest calendar, the Ides of March would have been the first full moon of the new year. 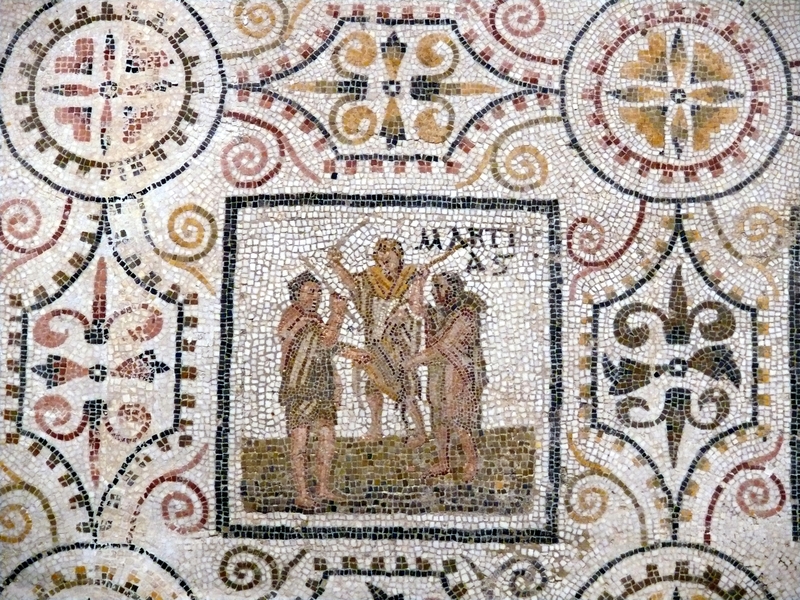 Panel thought to depict the Mamuralia, from a mosaic of the months in which March is positioned at the beginning of the year. Dated to the first half of the 3rd century AD, from El Djem, Tunisia, in Roman Africa. Photo taken at Musée archéologique de Sousse in Tunisia by Ad Meskens on August 1, 2002. Used under the Creative Commons Attribution-Share Alike 3.0 Unported license. The Ides of March (Idus Martiae) was marked by several religious observances and was notable for the Romans as a deadline for settling debts. The Ides of each month were sacred to Jupiter, the Romans’ supreme deity. The Flamen Dialis, Jupiter’s high priest, led the “Ides sheep” (ovis Idulis) in procession along the Via Sacra to the arx, where it was sacrificed. In addition to the monthly sacrifice, the Ides of March was also the occasion of the Feast of Anna Perenna, a goddess of the year (annus) whose festival originally concluded the ceremonies of the new year. The day was enthusiastically celebrated among the common people with picnics, drinking, and revelry. One source from late antiquity also places the Mamuralia on the Ides of March. This observance, which has aspects of scapegoat or ancient Greek pharmakos ritual, involved beating an old man dressed in animal skins and perhaps driving him from the city. The ritual may have been a new year festival representing the expulsion of the old year. In the later Imperial period, the Ides began a “holy week” of festivals celebrating Cybele and Attis, being the day Canna intrat (“The Reed enters”), when Attis was born and found among the reeds of a Phrygian river. He was discovered by shepherds or the goddess Cybele, who was also known as the Magna Mater (“Great Mother”). A week later, on 22 March, the solemn commemoration of Arbor intrat (“The Tree enters”) commemorated the death of Attis under a pine tree. A college of priests, the dendrophoroi (“tree bearers”) annually cut down a tree, hung from it an image of Attis, and carried it to the temple of the Magna Mater with lamentations. The day was formalized as part of the official Roman calendar under Claudius. A three-day period of mourning followed, culminating with celebrating the rebirth of Attis on March 25, the date of the vernal equinox on the Julian calendar. On the Ides of March of 44 BC, the conspirators staged a game of gladiatorial sport at the Theatre of Pompey. The gladiators were provided by Decimus Brutus in case their services were needed. They waited in the great hall of the theatre’s quadriportico. Caesar, however, was late, having received several warnings in the previous days. Therefore, Decimus Brutus was sent to fetch him, and managed to persuade Caesar to attend so as not to disappoint the Senate. Mark Antony, having vaguely learned of the plot the night before from a terrified Liberator named Servilius Casca, and fearing the worst, went to head Caesar off. 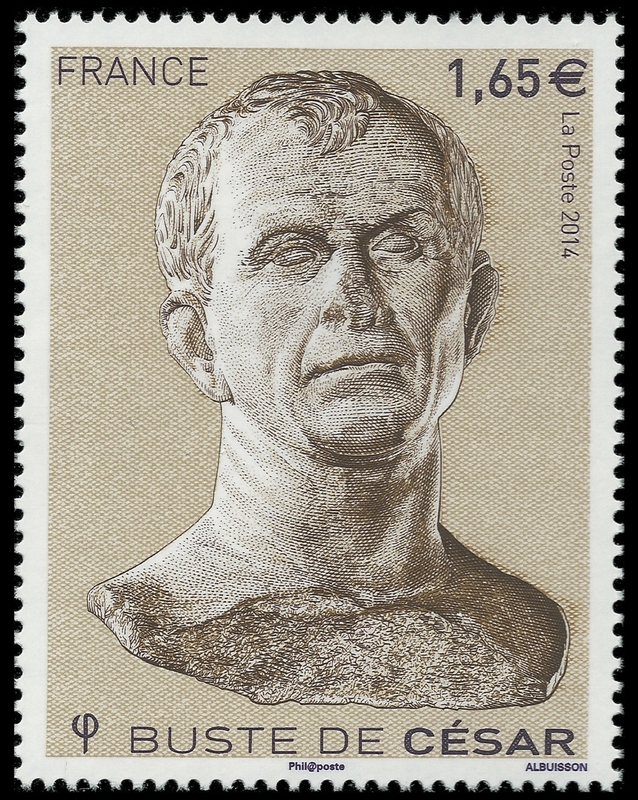 The plotters, however, had anticipated this and, fearing that Antony would come to Caesar’s aid, had arranged for Trebonius to intercept him just as he approached the portico of the Theatre of Pompey, where the session was to be held, and detain him outside Plutarch, however, assigns this action to delay Antony to Decimus Brutus. When he heard the commotion from the Senate chamber, Antony fled. According to Plutarch, as Caesar arrived at the Senate, Lucius Tillius Cimber presented him with a petition to recall his exiled brother. The other conspirators crowded round to offer their support. Both Plutarch and Suetonius say that Caesar waved him away, but Cimber grabbed Caesar’s shoulders and pulled down Caesar’s toga. Caesar then cried to Metellus Cimber, “Why, this is violence!” (“Ista quidem vis est!“). At the same time, Casca produced his dagger and made a glancing thrust at the dictator’s neck. Caesar turned around quickly and caught Casca by the arm. According to Plutarch, he said in Latin, “Casca, you villain, what are you doing?” Casca, frightened, shouted “Help, brother!” in Greek (“ἄδελφε, βοηθεῖ”, “adelphe, boethei“). Within moments, the entire group, including Brutus, were stabbing the dictator. Caesar attempted to get away, but, blinded by blood in his eyes, he tripped and fell; the men continued stabbing him as he lay defenseless on the lower steps of the portico. According to Eutropius, sixty or more men participated in the assassination. Caesar was stabbed 23 times. Suetonius relates that a physician who performed an autopsy on Caesar established that only one wound (the second one to his chest that pierced his aorta) had been fatal. This autopsy report (the earliest known post-mortem report in history) describes that Caesar’s death was mostly attributable to blood loss from his stab wounds. 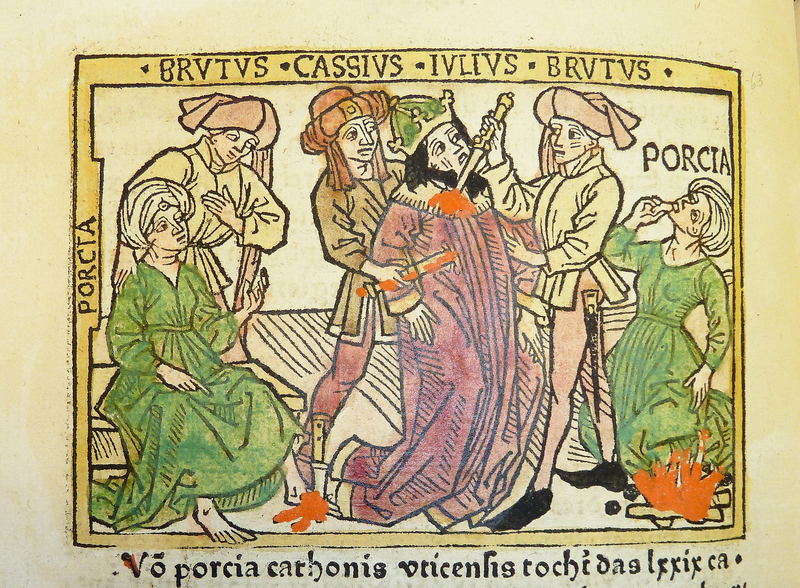 Woodcut illustration (leaf [m]8v, f. cviij) of Porcia Catonis counseling Marcus Junius Brutus, Julius Caesar’s death at the hands of Brutus and Gaius Cassius Longinus, and Porcia’s suicide, hand-colored in red, green, yellow and black, from an incunable German translation by Heinrich Steinhöwel of Giovanni Boccaccio’s De mulieribus claris, printed by Johannes Zainer at Ulm ca. 1474 (cf. ISTC ib00720000). One of 76 woodcut illustrations (1 on leaf [e]8v dated 1473), each 80 x 110 mm., depicting scenes from the life of the women chronicled (for a full list of subjects, cf. W.L. Schreiber, Handbuch der Holz- und Metallschnitte des XV. Jahrhunderts (Nendeln: Kraus Reprints, 1969), no. 3506). “Pour la première moitie le nom se trouve inscrit à côte de la tête de chaque femme, pour le reste il es ajouté entre les deux réglettes. Il n’y en a que trois, qui n’ont qu’un seul trait carré.”–Schreiber. Caesar was killed at the base of the Curia in the Theatre of Pompey. The dictator’s last words are a contested subject among scholars and historians. Suetonius himself says he said nothing, nevertheless, he mentions that others have written that Caesar’s last words were the Greek phrase “καὶ σύ, τέκνον” (“Kai su, teknon?“: “You too, child?”). Plutarch also reports that Caesar said nothing, pulling his toga over his head when he saw Brutus among the conspirators. The version best known in the English-speaking world is the Latin phrase “Et tu, Brute?” (“You too, Brutus?”); this derives from William Shakespeare’s Julius Caesar (1599), where it actually forms the first half of a macaronic line: “Et tu, Brute? Then fall, Caesar.” This has no basis in historical fact. Shakespeare was making use of a phrase already in common use at the time. According to Plutarch, after the assassination, Brutus stepped forward as if to say something to his fellow senators not involved in the plot; they, however, fled the building. Brutus and his companions then marched to the Capitol while crying out to their beloved city: “People of Rome, we are once again free!”. They were met with silence, as the citizens of Rome had locked themselves inside their houses as soon as the rumor of what had taken place had begun to spread. According to Suetonius, all the conspirators made off, and he (Caesar) lay there lifeless for some time, and finally three common slaves put him on a litter and carried him home, with one arm hanging down. A wax statue of Caesar was erected in the Forum displaying the 23 stab wounds. A crowd who had amassed there started a fire, which badly damaged neighboring buildings. In the ensuing years, the Liberators’ civil war resulted in the end of the Republic and the rise of Imperial Rome. 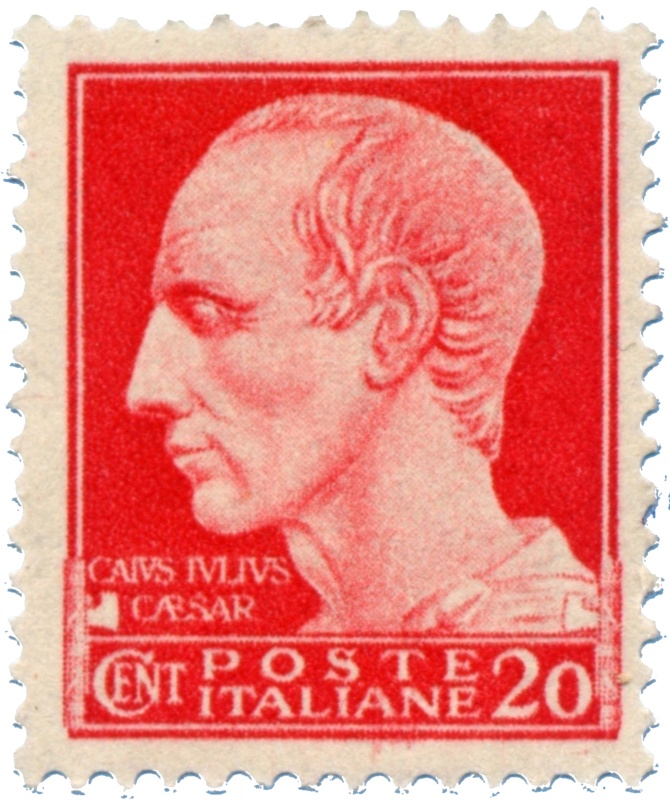 Virgil wrote in the Georgics that several unusual events took place following Caesar’s assassination. Who dare say the Sun is false? He and no other warns us when dark uprising threaten, when treachery and hidden wars are gathering strength. He and no other was moved to pity Rome on the day that Caesar died, when he veiled his radiance in gloom and darkness, and a godless age feared everlasting night. Yet in this hour Earth also and the plains of Ocean, ill-boding dogs and birds that spell mischief, sent signs which heralded disaster. How oft before our eyes did Etna deluge the fields of the Cyclopes with a torrent from her burst furnaces, hurling thereon balls of fire and molten rocks. Germany heard the noise of battle sweep across the sky and, even without precedent, the Alps rocked with earthquakes. A voice boomed through the silent groves for all to hear, a deafening voice, and phantoms of unearthly pallor were seen in the falling darkness. Horror beyond words, beasts uttered human speech; rivers stood still, the earth gaped upon; in the temples ivory images wept for grief, and beads of sweat covered bronze statues. King of waterways, the Po swept forests along in the swirl of his frenzied current, carrying with him over the plain cattle and stalls alike. Nor in that same hour did sinister filaments cease to appear in ominous entrails or blood to flow from wells or our hillside towns to echo all night with the howl of wolves. Never fell more lightning from a cloudless sky; never was comet’s alarming glare so often seen. The dead body of Caesar, painted by Bela Čikoš Sesija, before 1920. Currently in the collections of the Croatian History Institute in Zagreb. Two days after the assassination, Mark Antony summoned the senate and managed to work out a compromise in which the assassins would not be punished for their acts, but all of Caesar’s appointments would remain valid. 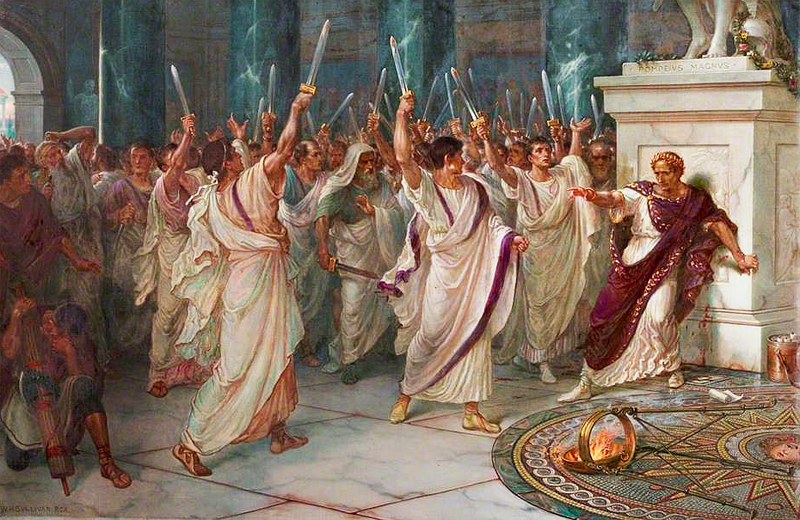 By doing this, Antony most likely hoped to avoid large cracks in government forming as a result of Caesar’s death. Simultaneously, Antony diminished the goals of the conspirators. The result unforeseen by the assassins was that Caesar’s death precipitated the end of the Roman Republic. The Roman lower classes, with whom Caesar was popular, became enraged that a small group of aristocrats had sacrificed Caesar. Antony, who had been drifting apart from Caesar, capitalized on the grief of the Roman mob and threatened to unleash them on the Optimates, perhaps with the intent of taking control of Rome himself. But, to his surprise and chagrin, Caesar had named his grandnephew Gaius Octavius his sole heir, bequeathing him the immensely potent Caesar name as well as making him one of the wealthiest citizens in the Republic. Upon hearing of his adoptive father’s death, Octavius abandoned his studies in Apollonia and sailed across the Adriatic Sea to Brundisium. Octavius became Gaius Julius Caesar Octavianus or Octavian, the son of the great Caesar, and consequently also inherited the loyalty of much of the Roman populace. Octavian, aged only 18 at the time of Caesar’s death, proved to have considerable political skills, and while Antony dealt with Decimus Brutus in the first round of the new civil wars, Octavian consolidated his tenuous position. Antony did not initially consider Octavius a true political threat due to his young age and inexperience, but Octavius quickly gained the support and admiration of Caesar’s friends and supporters. 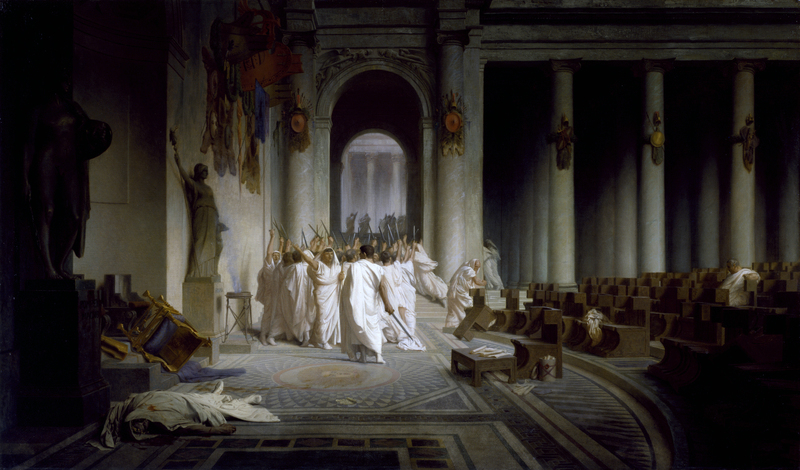 The Death of Caesar oil on canvas by Jean-Léon Gérôme between 1859 and 1867. Characteristically, Gérôme has depicted not the incident itself, but its immediate aftermath. The illusion of reality that Gérôme imparted to his paintings with his smooth, polished technique led one critic to comment, “If photography had existed in Caesar’s day, one could believe that the picture was painted from a photograph taken on the spot at the very moment of the catastrophe.” Currently in the collections of the Walters Art Museum, located in Mount Vernon-Belvedere, Baltimore, Maryland. To combat Brutus and Cassius, who were massing an enormous army in Greece, Antony needed soldiers, the money from Caesar’s war chests, and the legitimacy that Caesar’s name would provide for any action he took against them. With passage of the Lex Titia on November 27, 43 BC, the Second Triumvirate was officially formed, composed of Antony, Octavian, and Caesar’s Master of the Horse Lepidus. It formally deified Caesar as Divus Iulius in 42 BC, and Caesar Octavian henceforth became Divi filius (“Son of the Divine”). Seeing that Caesar’s clemency had resulted in his murder, the Second Triumvirate brought back proscription, abandoned since Sulla. It engaged in the legally sanctioned murder of a large number of its opponents in order to fund its forty-five legions in the second civil war against Brutus and Cassius. Antony and Octavian defeated them at Philippi. Afterward, Mark Antony married Caesar’s lover, Cleopatra, intending to use the fabulously wealthy Egypt as a base to dominate Rome. A third civil war broke out between Octavian on one hand and Antony and Cleopatra on the other. This final civil war, culminating in the latter’s defeat at Actium, resulted in the final ascendancy of Octavian, who became the first Roman emperor, under the name Caesar Augustus, a name that raised him to the status of a deity. Coin issued by Caesar’s assassin Brutus in the autumn of 42 BC, with the abbreviation EID MAR (Eidibus Martiis – on the Ides of March) under a “cap of freedom” between two daggers. 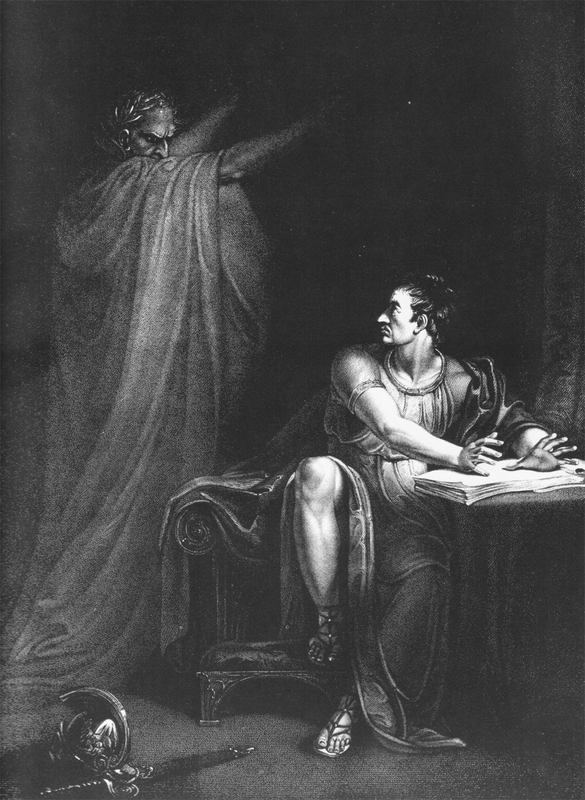 Brutus and the Ghost of Caesar (1802), copperplate engraving by Edward Scriven from a painting by Richard Westall, illustrating Act IV, Scene III, from Shakespeare’s Julius Caesar. Marcus Tullius Cicero was not a member of the conspiracy and was surprised by it, but later wrote to the conspirator Trebonius that he wished he had been “invited to that superb banquet”. He believed that the Liberators should also have killed Mark Antony. The conspirators had decided, however, that the death of a single tyrant would be more symbolically effective, claiming that the intent was not a coup d’état, but tyrannicide. Italy – Scott #257 (1930), Scott #213-231 (1929-1942). 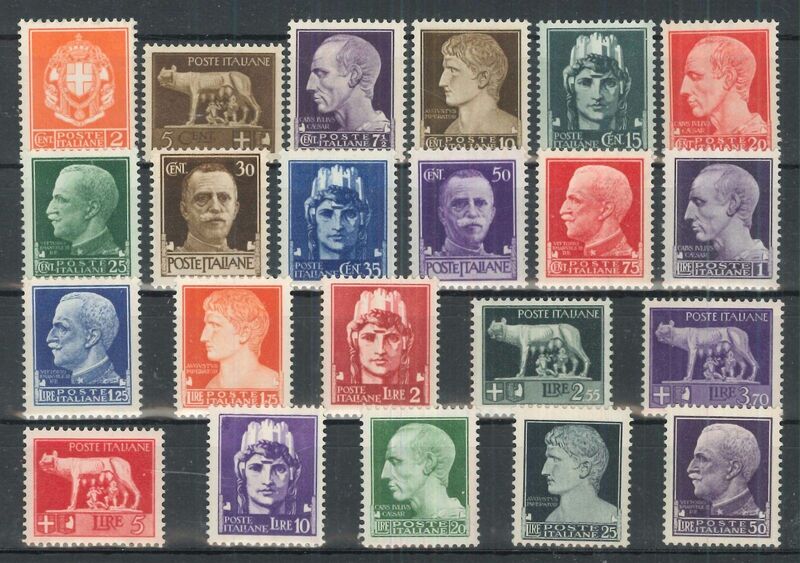 The Kingdom of Italy released a set eventually comprising 21 definitive stamps between 1929 and 1942 (Scott #213-231), four of which depicted the same design of a portrait of Julius Caesar (7½ centesimi deep violet, Scott #214; 20 centesimi rose red, Scott #217; 1 lira dark purple, Scott #222A; and 20 lire light green, Scott #229). These were printed by photogravure and perforated 14. 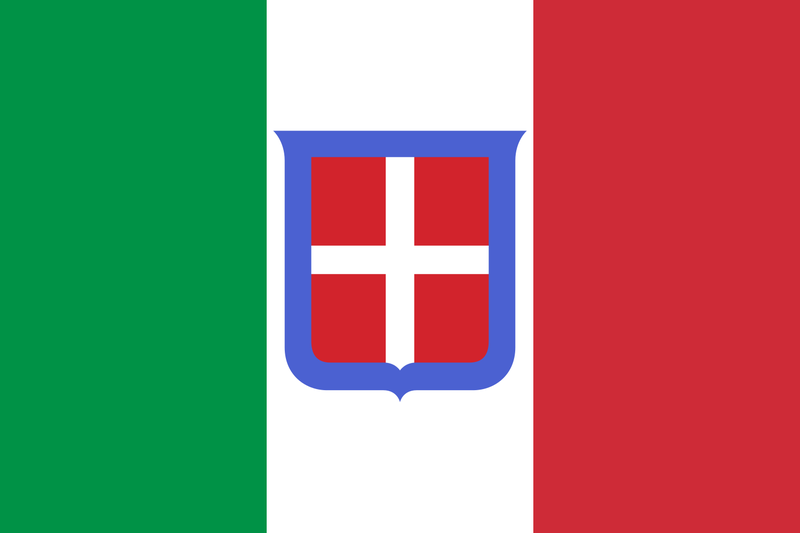 These would receive numerous surcharges and overprints over the years including usage in the short-lived Italian Social Republic, Ljubljana, and local issues for the Guardia Nazionale Republicana. Several denominations were reissued in 1944-1945 having been redrawn and the fasces removed (Scott #447, 448A, 452, 452A, 453, and 455). These, too, received a variety of overprints including during the German occupation of the Italian enclave of Zara which are unlisted in the Scott catalogue.